Jazz-funk concert as part of the event "Sunday Jazz on the Beach". 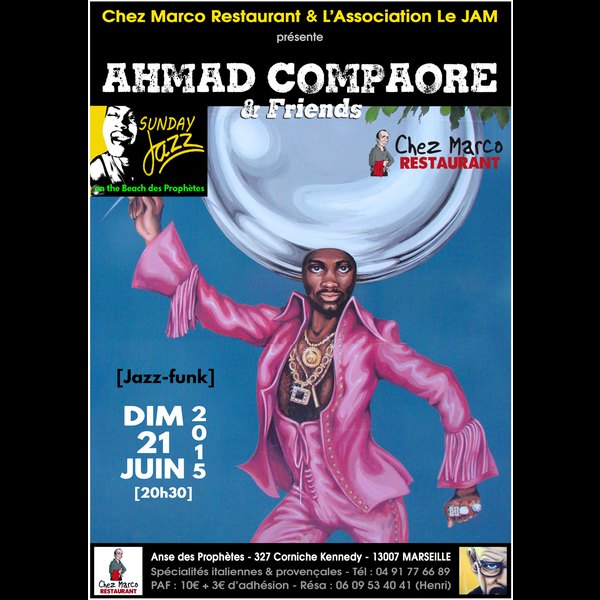 A proposal by Chez Marco Restaurant and Association Le JAM. 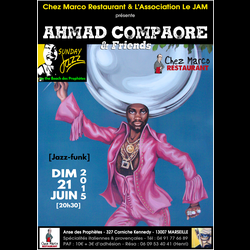 On the occasion of the "World Music Day", Ahmad Compaoré has concocted a repertoire with funky overtones, sustained by a new combo. The insatiable drummer invites us to discover his eclectic musical world: a subtle mix of jazz, fusion and world music, sustained by Oriental and African influences, with great detours in improvisation. Skilfully exploring various genres, no doubt he will once more convey to the audience his passion for sharing and his symbiotic relation to music! Catering available on the premises (Italian and Provençal specialities). Chez Marco Restaurant, Anse du Prophète, 327 Corniche Kennedy, 13007 Marseilles.